The complex features a new oceanfront park, restrooms and picnic facilities which complement the William O. Lockhart Municipal Pier. Beach chairs, lounges and cabanas are available to rent at the beach - visit beachservice.com for rates and information. A unique distinction on the second floor of the Casino Building is a 3,000 square foot ballroom that offers breathtaking views of the Atlantic Ocean with wrap-around terraces and provides a perfect location for weddings, special occasions and other events. 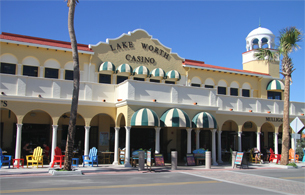 Visit lakeworth.org, for more information about this magnificent beachfront facility. Kids can try out the new beach front park or build sand castles and swim in the pristine beaches of Lake Worth. Surfers can delight in the waves or rent a paddleboard to enjoy the blue waters of the Atlantic. Take a stroll on the Municipal Pier, picnic in any of the shaded pavilions or take a nap and catch some rays.